This is Part Two of the Series on Creative Ways to Get Kids Yoga into Schools. 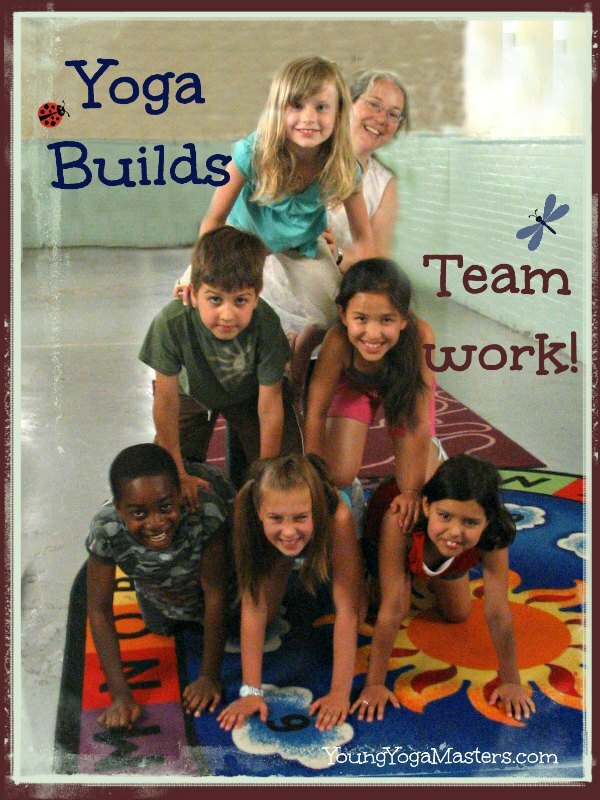 How can kids yoga teachers bring yoga into schools? Let’s talk! Check out why its not my favorite location and what these teachers do to bring yoga into schools. Leave a comment to give your opinion, advice, or experience on teaching yoga in schools. For school teachers, take a look at Part One for ideas to bring yoga into the classroom. Over the years, I’ve had many adventures teaching in schools and looking back, many of them had their challenges. First of all, there is a lack of budget in schools, it’s hard to get paid. You may get passed from one person to another trying to get answers. If you get a class going, you’ll probably have a lot of children in your classes. You may also find yourself leading yoga poses in all kinds of strange spots like hallways and beside desks. As I built my kids yoga teaching business my preference grew for a class in a community centre, daycare, private school or studio. There were so many obstacles working with schools and their accompanying bureaucracy. Yet with a little ingenuity, you can get kids yoga into a school and enjoy it. Many would argue, this is where the kids need it the most! Lunchtime Kids Yoga Class: One RCYT (Registered Children’s Yoga Teacher) charges $5 per child for her 30 minute lunch time class and has to cap the class at 20 kids. Her kids attend the school so she gets to see them at lunch. She can make up to $100 per class because they don’t charge her a room rental. It’s a win-win-win for all involved. After School Class: Personally, I’ve taught two ongoing classes by working with the school itself. One was held in the music room, It was arranged by a member of the parent teacher association so I didn’t pay a room rental. With the help of the parent, we charged per child for a series and collected the payments ourselves. I had to have a staff volunteer to supervise and that ended up being the reason the classes stopped. We couldn’t find another volunteer when the staff took a year off. Programs Through the School: My other class was part of a joint school/city run after school program. It was one of my first kids yoga classes, back in 1999. I hope this pay rate is out of date because there were 25 kids in the class and I got paid a whopping $22.50 per class! The children came to the gym after the school bell rang, ate a snack sitting on the floor (they brought their own snack from home), then stayed for the hour yoga class. There was very little admin for the class, I just showed up, signed in, took attendance and taught. Each class usually took me about 2 hours, but I only got paid for one hour. I admit, the after school class in the gym was the first class I dropped as my business grew. It was so much work for so little money. At the beginning of my yoga teaching, I ran around teaching 25 classes a week, making ends meet. That class was also how I learned to get good at teaching kids yoga. When I could teach 25 kids in one class, I felt confident to teach anywhere. It was a great way to learn on the job. Teachers in the Summer Certification get experience teaching all kinds of classes. I deliver classes before school (8-8.45 am) as a lovely gentle way to start the day. They are very popular and were requested by parents of children who dread going to school and launching straight into school work. They were also popular with children who have job share teachers as the hand-over day can be quite difficult. I charge £3.50 (just over 5 US dollars) per session but don’t need to pay for the space so would maybe charge more if there was a hall charge. I currently don’t have more than 12 children per session so that I can give each one some attention but there is enough for some fun group games. The trick to getting into a school is to have a connection, a staff or parent (or be a parent). You’ve got to get your foot in the door before they close it in your face. Knowing someone seems to help to get free use of the space. Otherwise some schools will charge you an hourly rate. If you pay an hourly rate please leave a comment and let us know the going rates these days at your school classes. This class took place in the hallway in the basement of the school. I’ve taught a few classes as Part of the Physical Education program paid from from the school budget. These have always been one or two time classes, not ongoing. I charged between $50 – $150 per class depending on where the school was located. Other teachers I know have charged up to $350 for a one time classroom presentation. In a panel discussion at the National Kids Yoga Conference, I heard yoga teachers who raise funds and collect donations to cover the cost of teaching yoga in schools. Others volunteer at a school until the school sees the value of the yoga program, then push the school to find a way to fund them. Still other teachers insist on being paid from the beginning. By emphasizing the benefits of yoga, the teacher can be paid out of one of the school budgets for character education, phys ed, or professional development. I’ve found getting paid by the school quite difficult, but learned that Kids Yoga Teachers can be very resourceful! Be Reliable and They’ll Want You Back! One thing I know for sure, if you are reliable, and people can find you, you’ll have the best chance of filling your schedule with kids yoga classes. One of the private school’s where I teach, I’ve gone to for over a decade! It’s much easier to return to a school rather then to keep finding new classes. If the program is stress-free, they will ask you back and that is good for everybody. Please leave a comment if you can add to the conversation on yoga in schools. What happened when you taught in a school and how did it work out? Have you had a hard time getting kids yoga into schools? I suspect there are many teachers who have had challenges getting into schools, and others who have found creative ways to bring yoga to the kids. I’d like to hear your thoughts on the subject and if this is a topic you’d like to hear more about. I teach k da yoga after school two days per week. My venue Is a hall just behind a primary school. I advertise through a flyer and an ad in the school newsletter (as well as Facebook and other free advertising) and the parents don’t have far to go after they have picked their kids up. That sounds like a great set up. It’s great that you can advertise in the school newsletter.